Do you know what I'm doing right now as I write this?? Like...on my TV. On a TV show. This is craziness. You know what else is craziness (in the totally awesome way that seeing myself on TV is craziness)? ARE YOU FRIGGIN KIDDING ME??! When I first saw this recipe on the Chocolate Moosey I was like, "Um, well, that's the best thing I've ever heard of." Then when I finally bought myself some cookie butter from Trader Joe's I was like "Ahhhh I'm gonna make myself some s'mores hot cocoa! Whatwhaaaat!" (imagine some dancing and hands raising the roof). And I didn't even have to share. Michael doesn't like this. So I waited until I came home one day and it was cold outside, and I was like "It is time. I will have myself some s'mores hot cocoa now. Yes." Let me 'splain to you how insane this hot cocoa is. It's like a surprise. You make the hot chocolate itself and you're like "Ugh this is like a super plain, not even that chocolatey hot chocolate, I am not sure about this." Then it's fun, because you get to toast marshmallows, and you're like "If nothing else, these are delicious." 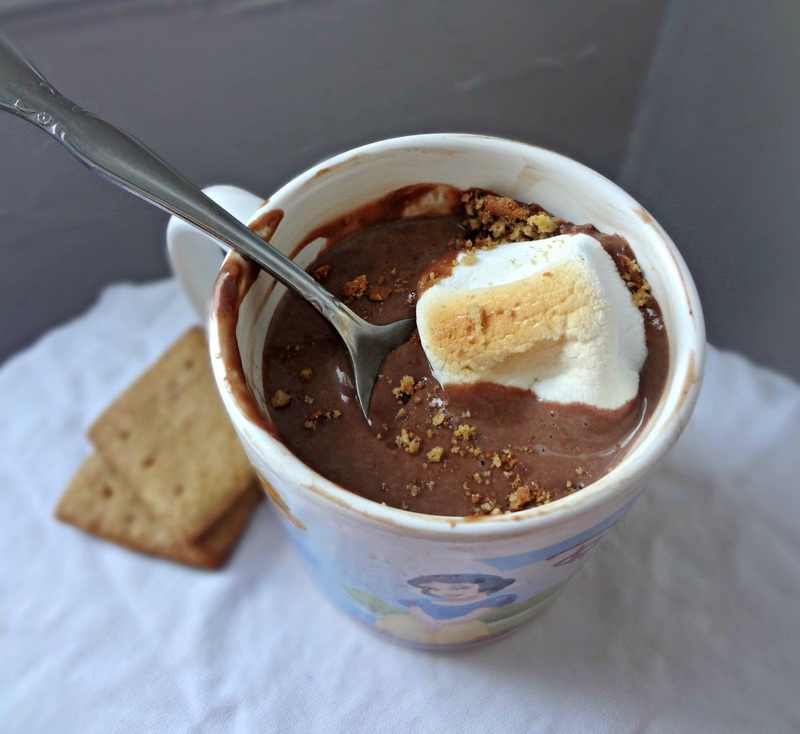 Then something magical happens-you whisk some of the toasted marshmallows into the hot cocoa (with some cookie butter) and it transforms into a thick, luscious concoction. 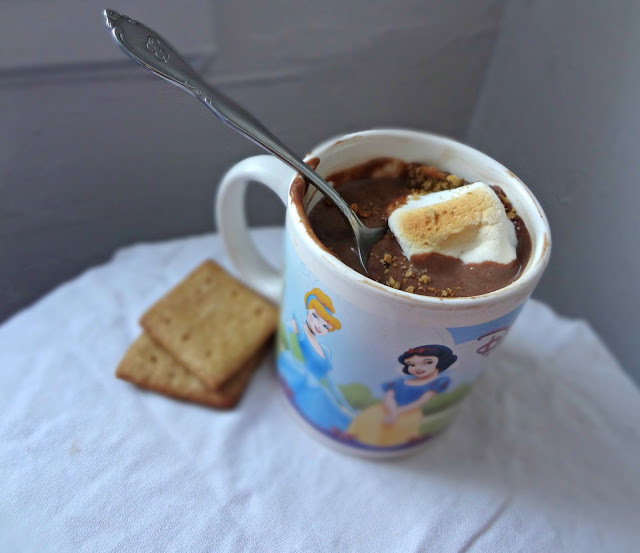 You throw it in a mug (if you're super cool like me, it'll have Disney Princesses on it), plop a marshmallow, some chocolate, and graham cracker crumbs on top and you have yourself the perfect cup of hot cocoa for any s'mores lover. And in case you haven't heard, I am a huge s'mores loverrr. Seriously-obviously you taste the chocolate. But the toasted marshmallow flavor is also totally present, and the cookie butter does a phenomenal job of giving you that graham cracker taste. I'm completely obsessed. 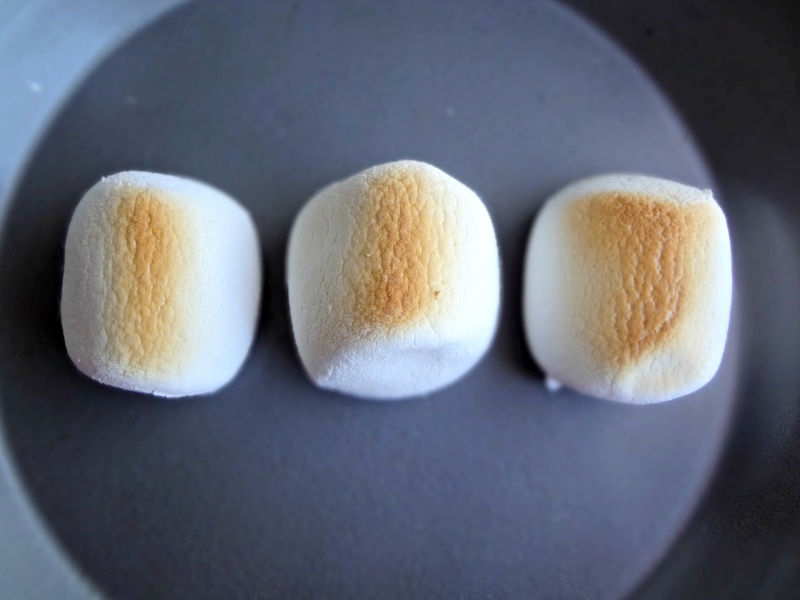 To toast marshmallows (if you don't have a blowtorch): place marshmallows on a broiler safe pan and turn on broiler. Place under the broiler and keep a very close eye,standing and waiting for the top to be toasted a golden brown. Flip the marshmallows over and do the same with the other side. Remove and put aside. In a medium saucepan heat milk until hot but not boiling (so steaming and starting to form bubbles around the edges). Whisk in cocoa powder and sugar until smooth. Turn off the heat. 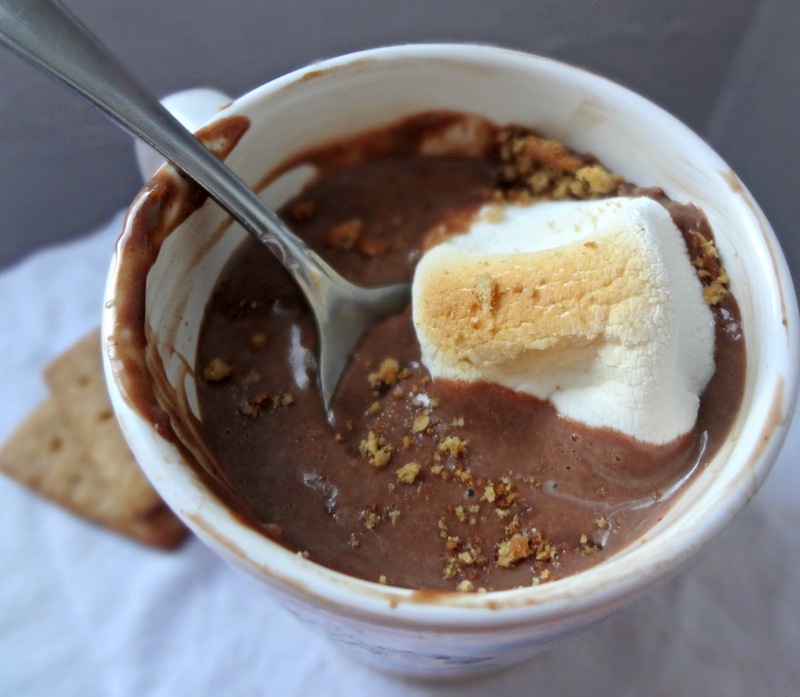 Whisk 2 of the toasted marshmallows and the cookie butter into the hot cocoa. Pour into a mug. (If desired, you can skip this step:) Place chocolate chips in 1 corner of an unsealed ziploc bag. Microwave until the chips are soft. Massage the chocolate until smooth. Cut a hole in the corner and pipe onto the unused marshmallow. 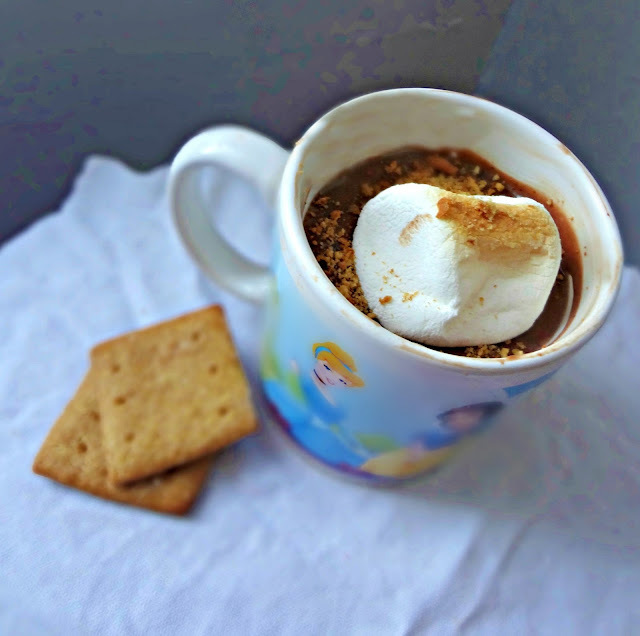 Place the marshmallow in the drink and sprinkle with the graham cracker crumbs. Ahhh sweet wondrous heaven in a cup!